兄 （Xiong): Senior brother. a respective way of calling a man who is older. 哥哥（Ge Ge): Senior brother. A more intimate way of calling a man who is older. 大哥 （Da Ge):Big brother/ Senior brother. Usually in a family having several boys. The younger ones would call the eldest one Da Ge. 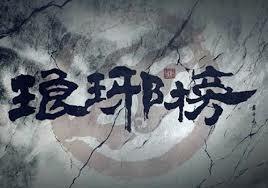 先生 （Xian Sheng): Mister /Master. It is a respective way of calling a knowledge man. Sometimes it also means teacher. The capital is rich and glorious, even the entrance gate is much larger and stronger than other places. Among the countless people and carriages entering the capital city, there is a carriage with dark green canopy driven by two houses slowly stopped just a few feet from the gate. 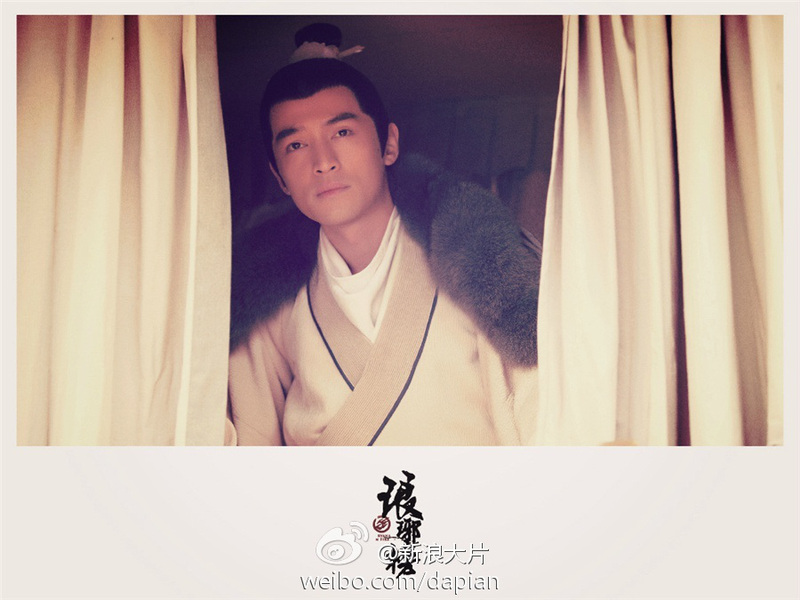 The curtain was raised, a skinny young man in the moon white clothing stepped down the carriage, walked up to the gate, raised up his head, and gazed the two characters on top of the city wall: Jin Lin (金陵). Mei Chang Su did not respond. He was still standing and gazing the city gate. The breeze blew up his black hair, letting a few of them fell and covered on his pale cheek, vicissitudes and desolate. Chong Li is a well-respected knowledgeable master for his generation. Although he was invited to the palace to teach the princes, he also opened classes to students outside the palace. Among his students, there were rich and poor, but to him, there was no difference. However, for some reason, he offended the emperor and was demoted from the teacher of the crown prince to a mere commoner. He angrily left the capital and passed away in gloomy. 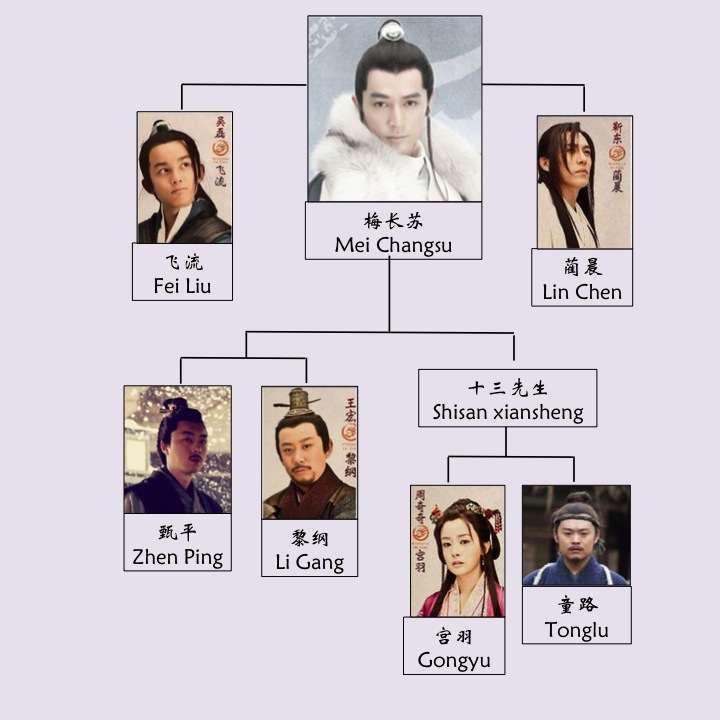 On their way to Jin Lin, both Xiao Jin Rui and Xie Bi found out that Su Xiong (Brother Su) was very knowledgeable, and were curious about the reasons. They did not expect him to the student of Master Chong Li. It was close to the dawn, just the time before the night market and the street appeared to be a little quiet. The three soon arrived in front of a grand mansion. A plaque on the top of the gate inscribed “ Mansion of Duke Ning”. “Go to report quickly, they are back!” a servant shouted right after he saw them, and also come to greet them. The three of them stepped down the carriage, and walked into the mansion. A mural is right in front of them, carved the emperor’s writing “Pillar of the Empire”. “Uncle Qin, how is father and mother?” Xiao Jing Rui asked an old servant who is coming out to greet them. “Xie Bi, do be impolite to your senior. You are supposed to call me senior brother.” Jing Rui tried to pretend his is talking seriously, but three of them suddenly all burst to laugh. Xie Bi was right. Jing Rui’s story was very bizarre. 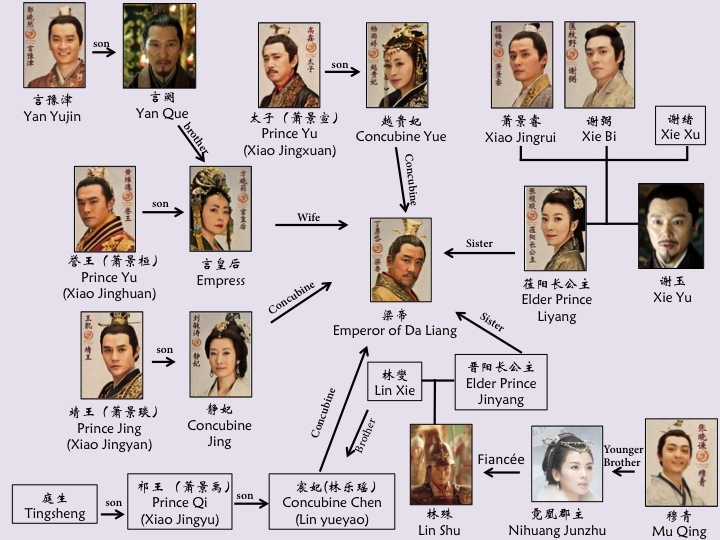 The story had both a royal duke and mountain Tianquan involved, which made it well know both among the royal families and ordinaries. 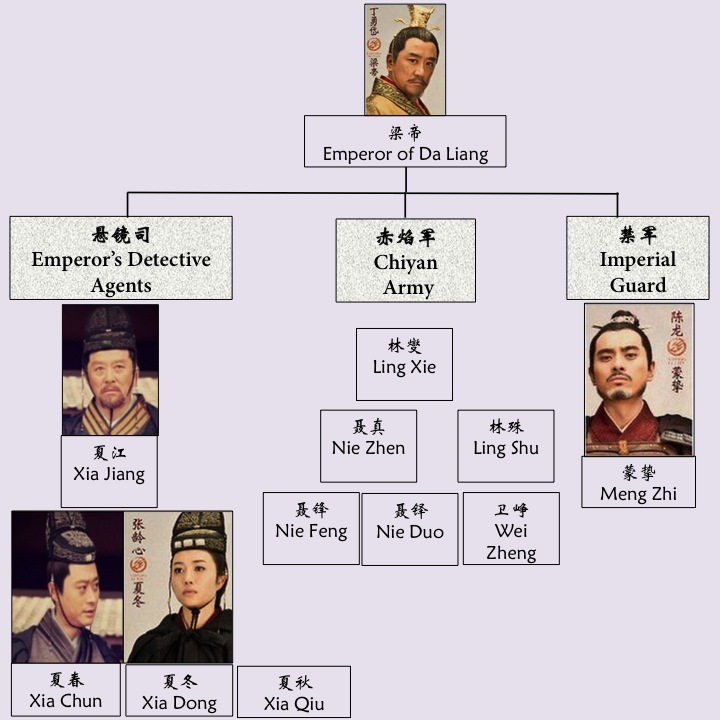 Twenty-four years ago, Duke Ning, Xie Yu, left his wife, the Elder Princess Liyang, and went to the battlefield in Xi Xia. In the same year, the owner of mountain Tianquan, Zhuo Dingfeng, sent his pregnant wife to his friend in Jin Lin, and went to challenge an martial artiest in the Hmong tribe. Unfortunately, an infectious disease called “locking the throat” stroked the city. The royals and the riches all left to the nearby temples outside the city to avoid being infected. Both Xie and Zhuo family happened to live in the two houses of the same temple. The two Mrs started to talk to each other and soon became good friends. One day, when they were chatting and playing weiqi (Chinese chess), they both suddenly went into labor. It was thundering and pouring outsides, the servants were all busy helping around. Finally, they heard the babies cry, and two boys were born. When everyone was immersed in the happiness and the midwives were giving the two boys the first bath in the same large bath barrel, a strange thing happened. The thunder suddenly stroke the tree in the garden, part of the tree was spited and fell onto the roof. The windows were all broken and, storm blew out all the candles. Suddenly, screaming everywhere. Servants dragged the two Mrs out of the room in panic. The midwives, who were frightened to the ground, dag out the two babies from the bathing barrel in the dark, and also ran out. Fortunately no one was hurt. After the new moms settled down, they realized another problem. The two babies were carried out of the same room in dark. Both were naked with wrinkle skins and crying. Their looked are similar, also weighted similar. Which one was Mrs Xie’s son, and which one was Mrs Zhuo’s? The next day, they are facing an even more serious problem. One of the babies died. Since Mrs Xie was the Elder Princess, this sad news unavoidably went to the emperor. The emperor ordered both families to take the baby into the palace. The royal doctor tested the baby’s blood, but his blood is homogenized with both sides of families. Looking at the two families, the emperor realized he is facing a dilemma.